Available this afternoon from NBC, a live stream of the final (successful!!) 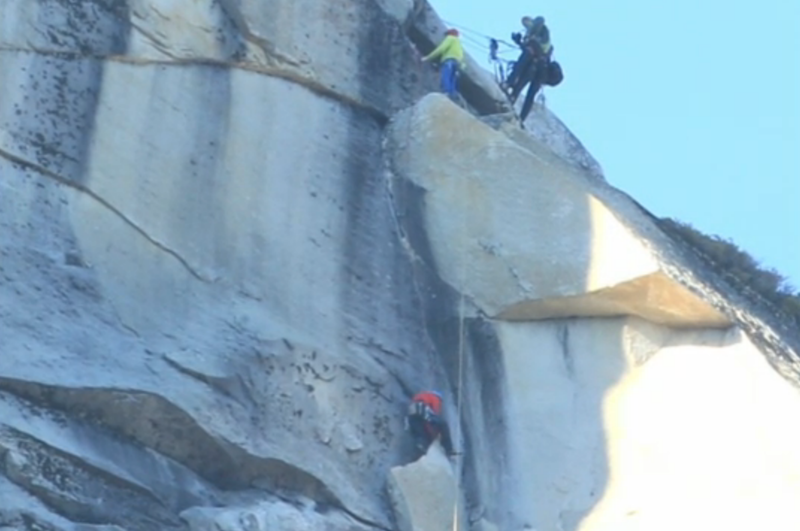 push to the top of El Capitan’s Dawn Wall. 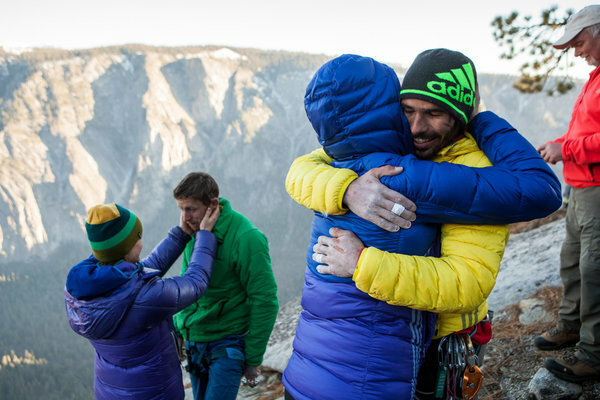 Congratulations to Kevin Jorgeson and Tommy Caldwell! The New York Times is posting updates. 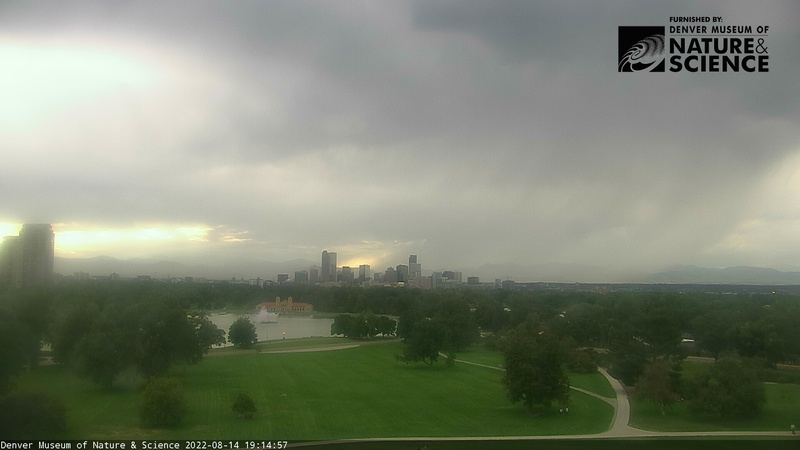 Screenshot from the feed at 12:48 pm MST: As Kevin (right) dropped down to this location, he exchanged a fist bump with Tommy. Both then could be seen checking their gear and changing (removing?) their socks and possibly their shoes (note Tommy’s bare foot). 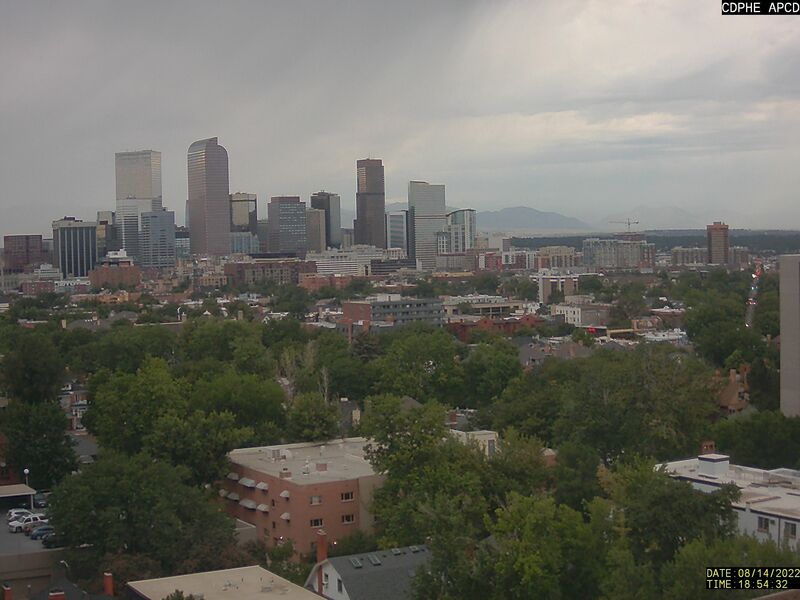 1 pm MST: That’s Tommy in the yellow shirt (after shedding green one). 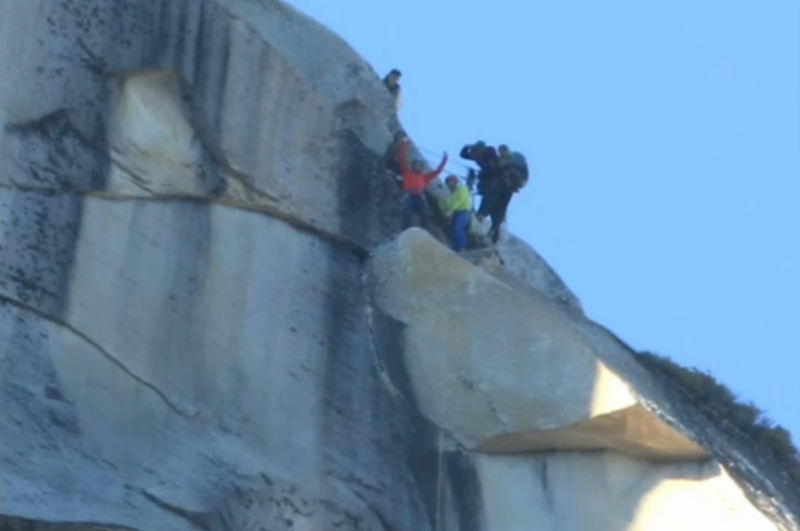 Kevin is above him to the left, in green shirt. 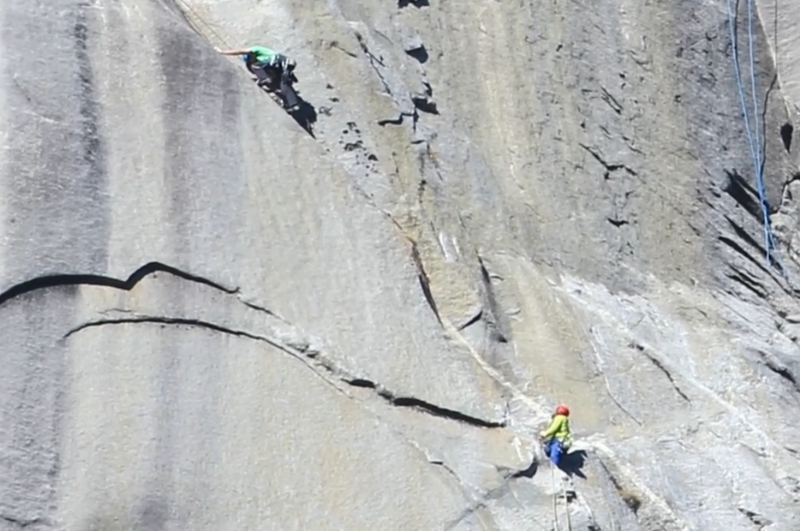 1:45 pm MST: Kevin waits, left, as Tommy reaches a stopping point to the right, where he raised a fist and cheered toward those waiting on top. 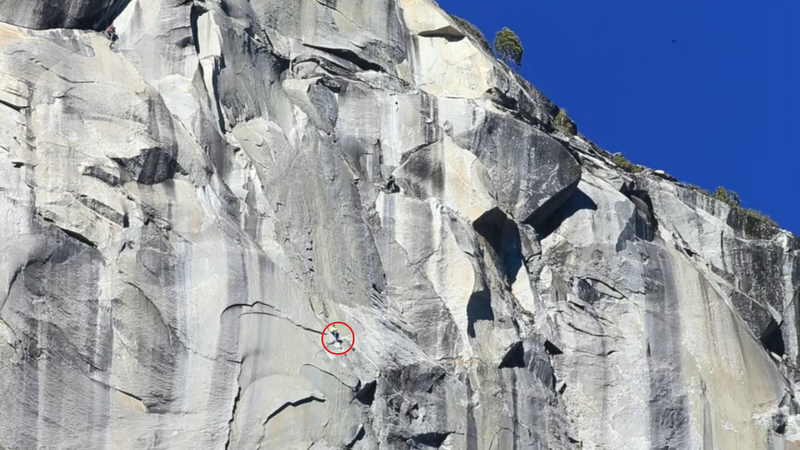 Minutes later, Kevin began the traverse to join him. Kevin steps carefully down toward his partner. 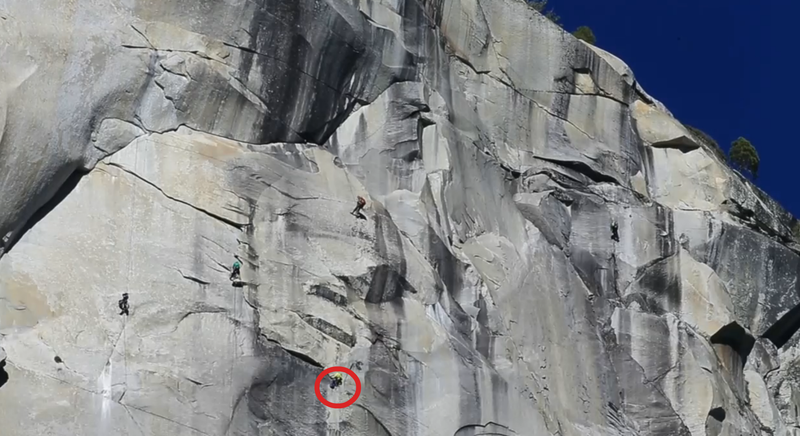 2:30 pm MST: Kevin rejoins Tommy and the two contemplate their next move. 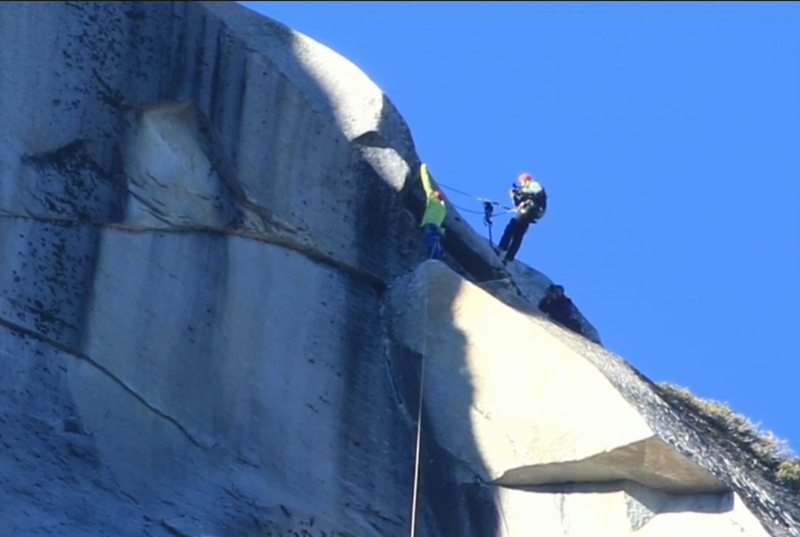 3:15 pm MST: In the middle of the picture, Kevin (left) shares ledge with cameraman. Tommy is below, just out of the frame. 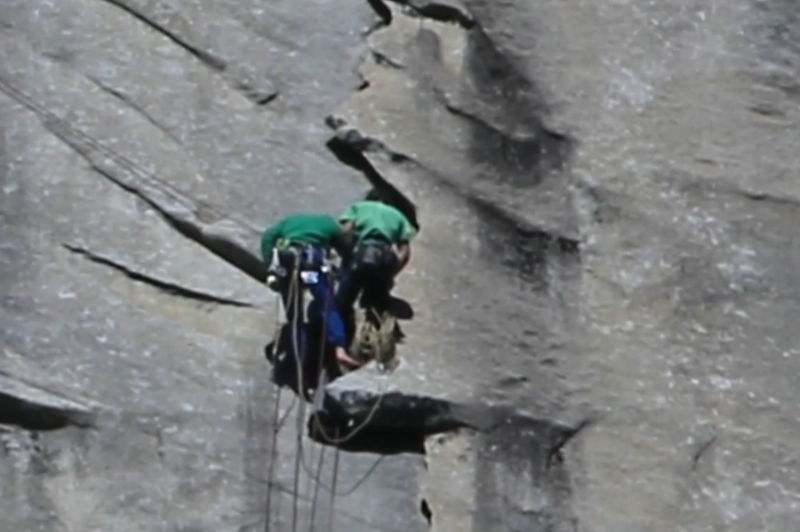 The top of El Capitan is not flat, so there will be no cartoonlike arrival — no hand appearing on the ledge from the abyss below. 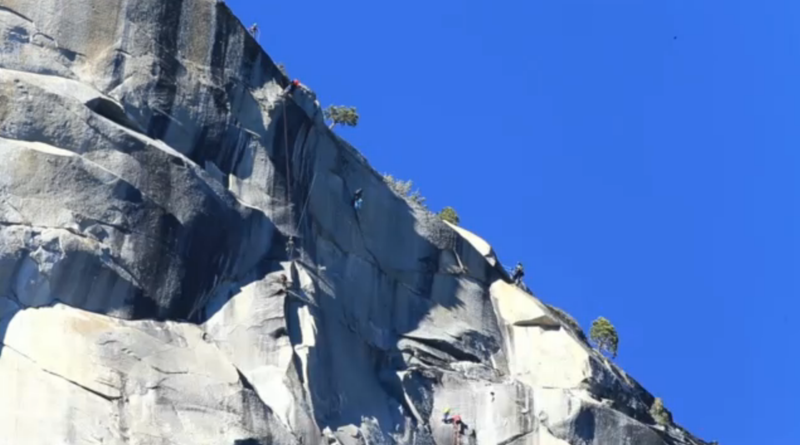 The vertical wall has no sharp edge at the top, but gives way to a steep slab of granite, sprinkled with crumbling rocks and small pines and shrubs. A dropped ball 100 yards from the cliff would bounce and roll downhill and then plunge out of sight. Almost there. Tommy looks up at the last half of the last pitch. The dream realized, Tommy raises his arms in triumph. Kevin negotiates the last few yards to join Tommy and complete their historic climb. 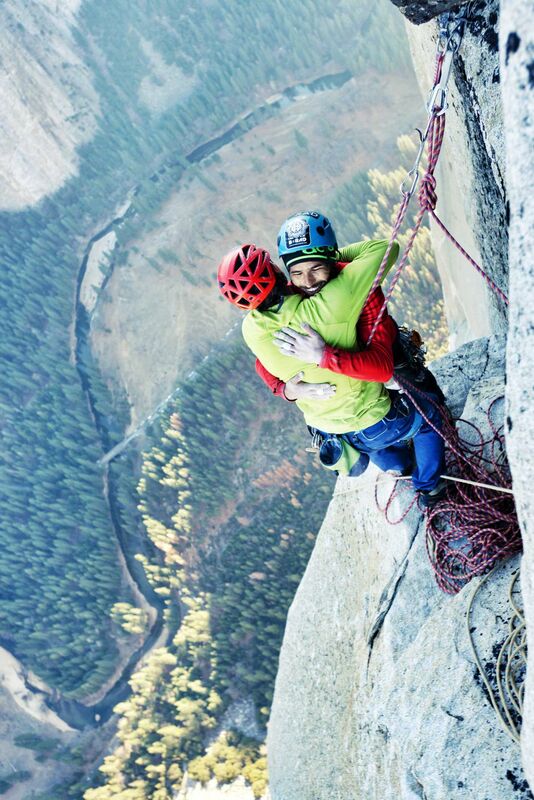 4:20 pm MST: As cameramen look on, the climbers share a celebratory hug at the top of the last pitch. Kevin turns and cheers to those watching from the valley below. 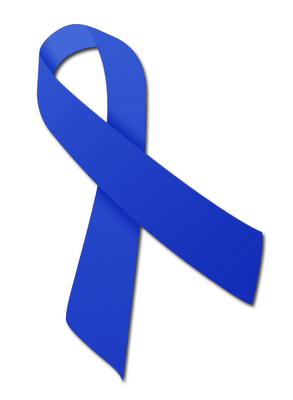 Congratulations, guys! Job well done. Damn well done!! 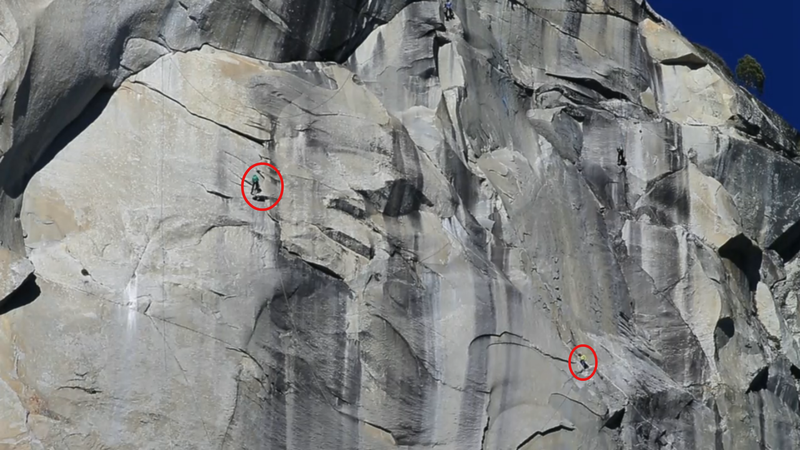 It was interesting trying to keep track of which climber was which. They kept putting on and taking off various shirts and jackets. I was intrigued that they stopped to change socks and maybe shoes. Couldn’t tell for sure. After the hug up top, they both sat down and changed shoes and (donned?) socks again, put on warmer jackets, and ditched the helmets — all before leaving that last perch and moving up and over to meet the folks waiting for them. 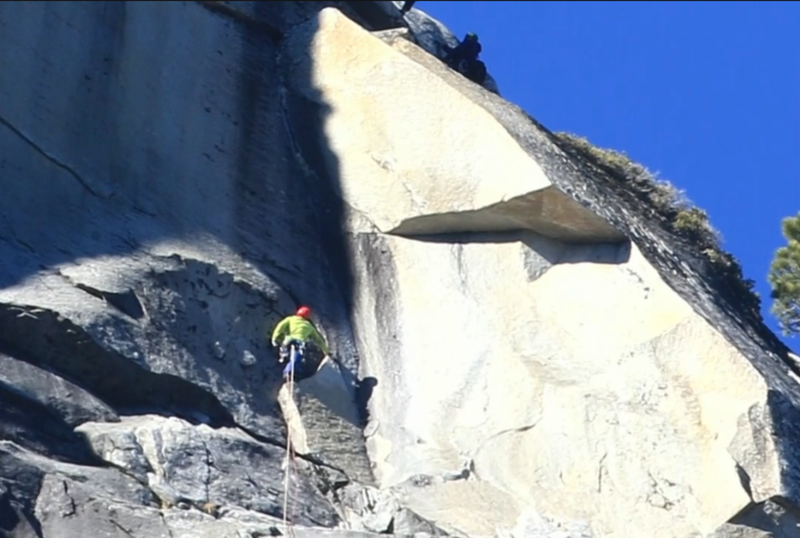 I read somewhere that Kevin wore that lime green t-shirt for the entire climb in memory of a climbing friend, Brad Parker, who was killed in a fall a few months earlier. 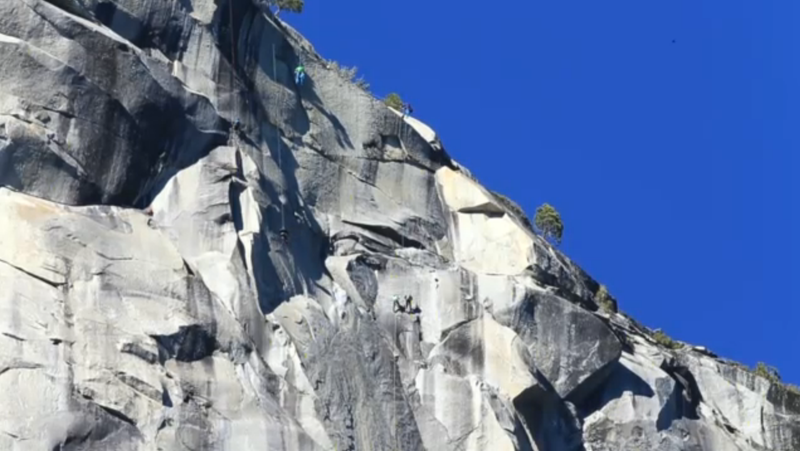 Every inch of their climb was photographed and filmed. I’m sure there will be an awesome movie available someday. P.S. 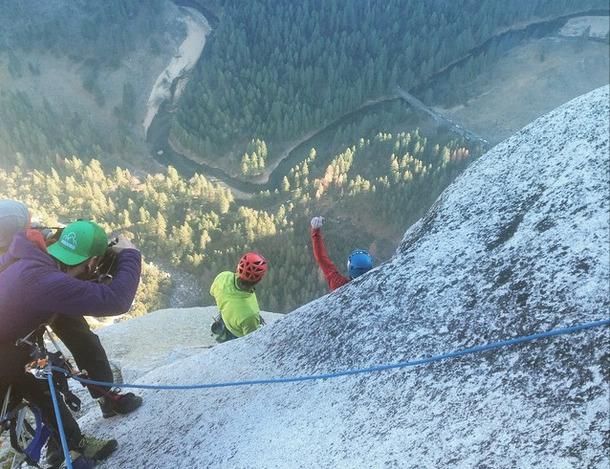 The Dawn Wall is approximately three times as high as the Diamond!